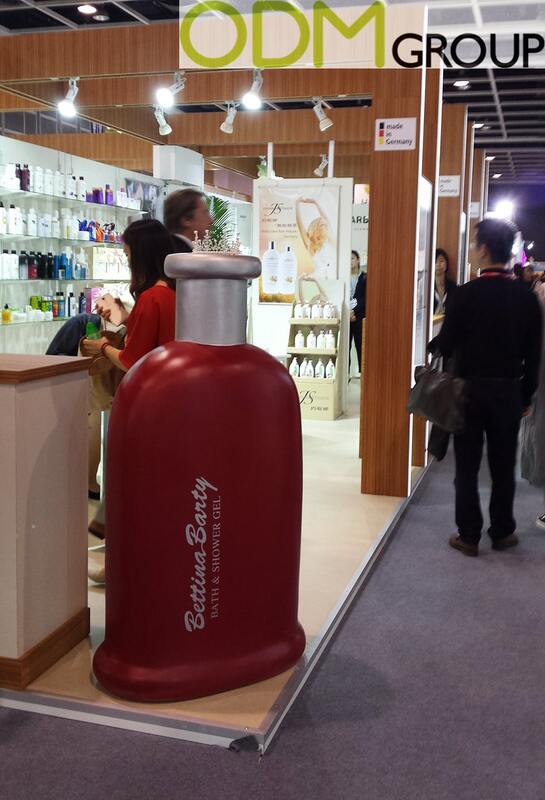 Spotted at the Cosmoprof Trade Fair in Hong Kong: Bettina Barty, the famous cosmetics brand, is taking maximum advantage of its marketing, by using a creative POS display, made in the shape of their popular bath and shower gel bottle. The cosmetics line Bettina Barty, produced by German company Straub GmbH, stands for affordable bath, skin and body care for the daily needs. The products’ distinguishing features are: an intense and very special fragrances, functional and shapely bottles and the highest quality. Straub GmbH is a family-run cosmetics company based in Wertheim, Germany. It is one of the leading manufacturers of high-quality care products in the country, producing more than 900 different cosmetic products and export them to 70 countries worldwide. How Creative POS Display Makes Your Brand Stand Out from the Crowd? A very important marketing strategy is the appearance of your product. The key idea is to make your potential consumers get really interested in your product at first sight. This will allow them to take the next move into purchasing your product. Just imagine when your custom advertising displays are placed near the entrance to the store, in shopping malls, or on trade show stand, with a huge amount of people walking by: with extremely high visibility of these promotional displays, they guarantee to not only raise awareness of your brand, but will also serve as an incentive for attracting customers to enter the shop, which will consequently increase sales. Creative POS display also works as a tool for a product’s differentiation, therefore providing a competitive advantage for your brand, by distinguishing it from the others. Such a unique outdoor advertisement, as this one, branded and customised, made in the shape of the bottle, and looking exactly like Bettina Barty bath and shower gel, represents a great example of advertising display for cosmetics industry, and it for sure will draw the attention of the public. It can also serve for in-store marketing in your shop. Here in ODM we specialise in manufacturing POS displays of all kinds, so feel free to contact our Sales team to learn more about promotional products, which you can include in your marketing strategy. We have years of experience with sourcing promotional products for companies all over the world.